Chipmunks are wee striped critters that are part of the family Sciuridae, of which they are the tiniest members. Chipmunks exist in 25 different species, the majority of which reside in North America. As diminutive creatures, the dangers of predation are a big concern for chipmunks. When chipmunks are in fear mode, they often rely on their running skills, which are extremely strong. They are small but swift animals. If something menacing is headed their way, they immediately flee the scene by running, hopefully to find secure hiding spots in between thick plants or stones. If they're lucky, their burrows are near enough that they can seek sanctuary in them. Chipmunks sometimes face the unpleasant reality of predators actually coming inside of their burrows. The diurnal animals are believed to be able to pick up on these unwelcome predator visits by noticing abrupt shifts in atmospheric pressure. Noticing the shifts enables chipmunks to respond swiftly to dangerous situations, perhaps by simply departing their burrows out from different openings. Chipmunk burrows, conveniently enough, are often equipped with multiple entry points. Chipmunks feel in danger when predators are on their way, and they also feel that way when they notice that others are encroaching on the territories surrounding their dens and burrows.These rodents, on the whole, possess prominent territorial streaks. 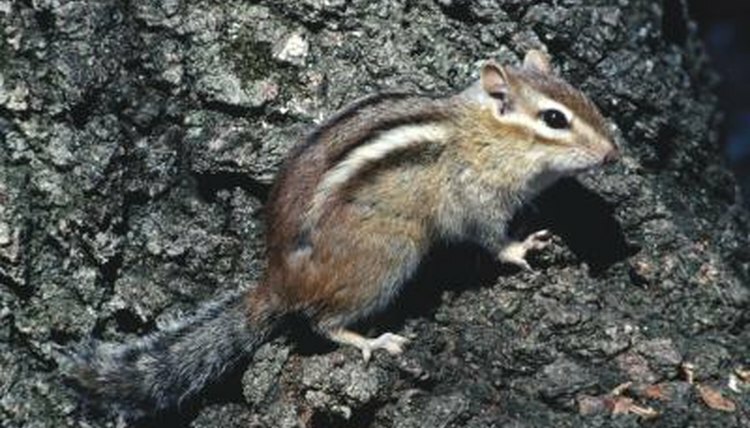 When chipmunks want to drive invaders away from their personal turfs, they often respond by being extremely loud, giving off deep sounds that are reminiscent of repetitive "chucks." When they're shocked, they often make piercing "chit" sounds, as well. It isn't uncommon for chipmunks to respond to the presence of human beings by making these vocalizations. When chipmunks battle, they frequently nip each other. Territorial scuffles are commonplace in encounters between chipmunks unfamiliar with each other. There are many chipmunk predators, including bobcats, raccoons, martens, weasels, rattlesnakes, coyotes, lynxes, badgers, red-foxes, ermines and red squirrels. Sizable birds of prey also frequently go after them, from hawks to owls. Chipmunks are active in the day hours, and that leads to many fellow diurnal predators focusing on them. Cats and dogs kept as pets sometimes zero in on chipmunks, too. Chipmunks deal with the hazards of predation by constantly being vigilant and prepared to get away. They're perpetually on the lookout for danger.